The Art Bar debuts on Main Street at Van Arnold Jewelry with a "Valentine's Weekend Art Show"
SCOTTSDALE, Ariz. - Feb. 5, 2019 - PRLog -- The Art Bar is hosting their annual "Valentine's Weekend Art Show" Thursday, February 14 through February 16, 2019. This fantastic Pop Up Gallery will showcase the work of Donna Bernstein, Donna Armstrong, Vlad Itskovich and David Armstrong. 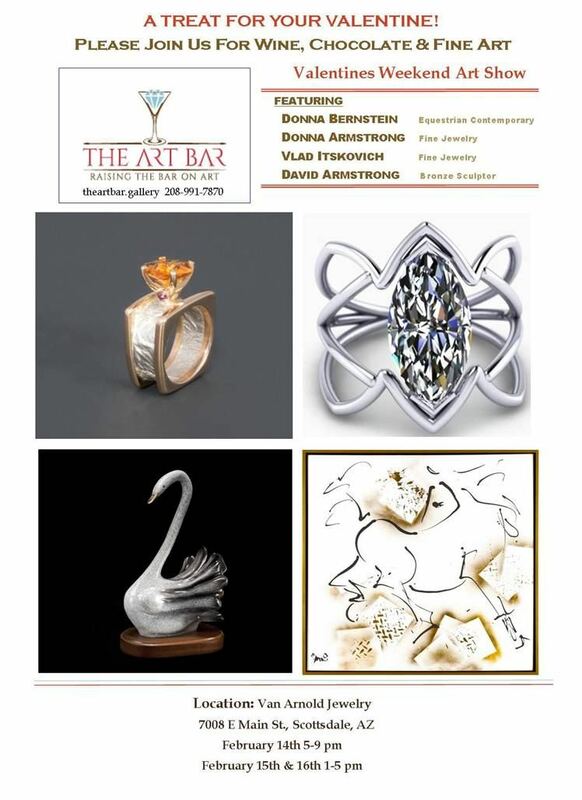 Highlighting equestrian contemporary artwork from Bernstein and original jewelry from Donna Armstrong and Vlad Itskovich, it will include a unique Gem Stone show and sale, and bronze sculpture from David Armstrong. Guests will enjoy chocolates and wine during the evening reception on February 14 from 5:00pm to 9:00pm. Additional weekend shopping hours will be held on February 15-16 from 1:00pm to 5:00pm. Donna Bernstein is a contemporary equestrian artist whose careful attention to equine, and with a unique understanding of their anatomy and personality, creates art in a signature intuitive style. "Horses have always been for me a source of healing, energy and life. I feel closely aligned with the ancient cave paintings; minimalist, primal, intimate. I have learned that it is not horses that I paint; I paint the way they make me feel". Bernstein mixes mediums and materials in unique and uncommon ways, often using no brushes or tools to create her inked horses. She drips and directs proprietary mixtures of acrylics, water-based inks and pigments in alchemical spontaneity, her passion made visible. Bernstein is now expanding the design of her paintings into equestrian fashion silk scarves, celebrating her work as wearable art. Represented in West Palm Beach, Atlanta and the Hamptons. For more about artist Donna Bernstein visit www.donnabernstein.com. Donna Armstrong' distinctive designs reflect the dedication and detailed workmanship that has become synonymous with Donna Armstrong Jewelry. With training at Gemological Institute of America, the Revere Academy and many years of experience, Donna creates unique jewelry for a select group of jewelry lovers. Many of the techniques used by Donna are a revival of ancient metal working processes; reticulation, fusing, and chain maille used throughout history. Each piece incorporates exquisite gemstones and precious metals to create fashion forward designs that are influenced by cultures and historical periods; classic, simple yet unique. A graduate of the Gemological Institute of America, Donna has been designing and creating jewelry for nearly 25 years. For more about this artist visit http://darmstrongjewelry.com. David Armstrong is a metal sculptor, passionate about his metal art, including furniture, sculptures and wall art as an outlet for his creativity and knowledge. His hope is to bring enjoyment of intriguing and positive art into the lives of the viewers and owners of his fine art.He has designed and built numerous unique architectural projects over the last 45 years. Armstrong holds a BS Degree and B-ARCH Degree in Architecture, a Master's Degree in Mediation and Arbitration. For more about artist David Armstrong visit davidarmstrongmetalsculptor.com. Vlad Itskovich began his prestigious career as an apprentice to diamond setters In New York over 26 years ago. Throughout the years he perfected his craft including mastering the details of both design and the making of fine jewelry pieces by hand. He worked with the global jewelry firms David Yurman and Tiffany & Co, as well as other high-end jewelers and designers. As his career evolved his designs took on their own clean, definitive style, marked by creative settings and beautiful lines. As a longtime jeweler Vlad moved to Arizona in 2004,and is the owner of Van Arnold Jewelry, newly opened on Main Street in Scottsdale. Specializing in custom jewelry pieces Van Arnold Jewelry will host a special Gem Show for Valentine's Day at the store, selling unique stones to be custom designed into jewelry. The Art Bar presents pop up art galleries to showcase their work and invited guest artists, bringing the fun back into collecting art or, as they say, "Raising the bar on Art." The Art Bar Gallery will be located in Van Arnold Jewelry at 7008 E. Main Street, Scottsdale. For more information about "The Art Bar" visit https://theartbar.gallery or their new "Valentines Weekend Art Show" please contact Donna Bernstein at 208-861-4331 or email donnab@theartbar.gallery or Donna Armstrong at 208-991-0787.